We first opened our doors nearly 20 years ago, and have been hosting lessons for all abilities, parties, corporate days and competitions ever since. Find out more about us on our About page. And if you're struggling to decide if a shooting experience day is for you (or would make an ideal present), then just have a look at some of our glowing testimonials below. My adult daughter and I were staying in St. Andrews, Scotland and wanted to try clay shooting for the first time. We had a great experience ! The gentleman conducting the lesson for the two of us was knowledgeable, patient and pleasant. He was so helpful and had a great sense of humor. He made it fun and informative . If you find yourself in this area, it’s worth a try. They deal with beginners like us as well as very experienced hunters. We were there on Saturday (group of 3) and had a great time. Ron took us through some set up and then we were out to shoot clays. Ron was great with the group tailoring the amount of help and guidance he gave to each individual. Would happily recommend to anyone and will certainly be back in the near future. This was a birthday gift from two of my friends and although I was a bit apprehensive at first, that soon disappeared with the warm welcome we received. My instructor was Ron Maxwell, who was very professional and explained everything very clearly so that a first timer like myself could understand. Not only was he very professional but had a great sense of humour which relaxed everyone. I am still buzzing I enjoyed it so much and would recommend the experience to everyone no matter of age!!! My son and his wife got me this as an Xmas gift and I got my son it as a birthday gift. We both decided to go together. We were welcomed by Rob and then introduced to Gordon our instructor for the lesson. It was the first time shooting for the both of us and Gordon made us feel really at ease. Gordon then gave us a few tips and advice on how best to hit clays. It was not long before we were both finding our aim and hitting the target. Great experience and well worth it. I’d never fired a gun before, but Gordon put me at ease very quickly and guided me through learning to shoot. He was just so easy to work with, and after a few (not so close !) opening shots we eventually honed my technique . Once I got my eye in, it was an exhilarating experience! Highly recommended, the Centre is a lovely place, great fun, and there is no pressure to hurry or rush - it’s all about enjoying your time with them. Thank you Gordon - you are a Gentleman! I've held my shotgun certificate for a while and have been looking for local places to Dundee where I can go with friends and introduce them to the sport without having to be part of a larger group or take up time with an instructor. 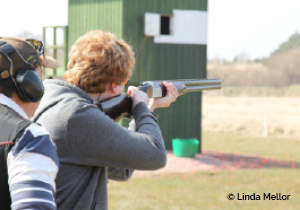 The Scottish Clay Shooting Centre are really flexible and the Claymate system that they have in places means that you can shoot as much or as little as you want which is ideal for going with friends. The staff are really helpful and very welcoming, they helped out some of my friends with shooting vests, shoulder pads, protective glasses and ear protection. The traps are really easy to operate with a wide variety of setups on offer, we only made it to three of the traps which was more than enough to keep us entertained. All in all, it's a great bunch of people that operate this centre and I only wish I could make more time to go more often! We had such a great experience here. Ron our instructor was really great. As a first timer myself I was a little apprehensive, however Ron quickly changed my mindset with three words, PMA ;-), legend! We would highly recommend this to anyone who would like a new experience or to polish up on previous skills and best of all have a bit of fun! What a fantastic experience! Easy to book, great value for money and extremely friendly and helpful instructor. Highly recommend the introductory course for those who have not shot before, or looking for a refresh. Looking forward to going back soon! Don't miss it! Our instructor was patient and very informative. We had great fun. An adventure that was spot on the target. Second time we have been.. excellent instructor very patient made you feel at ease, fully recommend it great for beginners like us!! Thank you see you soon. Went for an introductory session with my son in early December 2017. The information and time spent introducing us to all of the principles, equipment, safety procedures, and so on were very good. Very patient, very detailed and took all the time necessary to make sure we knew what we were doing and what to expect. My son was equipped with a 20 bore supplied by the centre, and I had a 12 bore. We tried clays from 3 different traps and by the end were trying doubles from the final trap. Instruction during the session was helpful, patient, constructive and highly effective, great morning out , really enjoyable. The only downside was my son hitting more clays than me! Had a very fun morning learning how to shoot. Derek was a fantastic teacher and lots of fun. I would definitely recommend a visit here. I came here with a friend on the Saturday the 25th of November, to have a go as we had not done clay pigeon shooting before. It was a delight, the instructor (Stewart I think) was very friendly and very professional. It was a bit pricey but compared to the other centres in the area (there wasn't many) the prices were at the competitive rate. Also the other staff in the reception area were friendly too. Would certainly recommend to a friend. Attended the centre as a group of friends for a 30th birthday. The instructors were great, made us feel at ease with the guns and safe but also up for a laugh. We had a shot of both shooting in the air and also at "rabbit" level. Great fun and would highly recommend! We (daughter and I) went for a standard class. Instructor was Stewart. There was a mixture of experience with guns between us but Stewart worked round that extremely well. Couldn’t speak highly enough of the tuition and the information on clay shooting in general. Facilities were very good for this type of venue. It wasn’t particularly busy but the venue is very well laid out and can clearly handle a high number of shooters at the same time. Would have absolutely no hesitation in recommending the shooting Centre. If you have shot before or just want to see what it’s like for the first time it is well worth a visit. Went for my partners 50th birthday, wanted something different to do. Had a great time, the staff were very supportive and friendly. Ron was great as an instructor, he was very patient, took his time to explain where I was going wrong. I did not feel rushed or under pressure to end the session. We booked to return in two weeks time. Thank you for the lovely experience. A brilliant facility suitable for all. Friendly welcome and superb instruction from Ron who had us hitting the clays pretty much from the off! 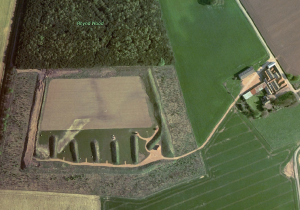 If you've never tried clay shooting before, you've got to try the Scottish Clay Shooting Centre. It really is a hidden gem. But be warned, you might get hooked! Will be booking another lesson soon. Had a great afternoon at the Scottish Clay Shooting Centre. Brought my girlfriend along for her first ever go with a shot gun. She was quite nervous at the start but Derek our instructor was great and soon had her shooting and hitting targets! She now can't wait to come back and try again. My mate and I had the intermediate lesson gift vouchers. Awesome experience, will definitely be back. The instructor, Ron was fantastic his patience and tuition had us shooting like top marksmen by the end of the lesson. Would recommend it for anyone. Took my sister here today for our first ever try at clay pigeon shooting and it was amazing a huge thanks to George for making us feel at ease and making us laugh the entire time! I would definitely recommend this and will be back! From seasoned professionals to complete beginners, the SCSC can provide expert tuition for every level..